According to Which?‘s survey of over 7,000 broadband customers, almost three quarters (71%) of respondents have been with their ISP for “at least” 3 years. Typically most of the discounts that big ISPs tend to offer only last for between 12 to 24 months (i.e. designed to match the minimum contract term) and once you get out of that period then the prices can shoot up. For example, customers of Virgin Media faced the “biggest price rises” of the 12 providers. Overall the ISP achieved a satisfaction rating of just 59% and yet 79% of their customers still stuck with the provider for 3 years or more (perhaps because in many areas nobody else can beat their ultrafast speeds). But when moved on to a standard tariff, Virgin’s users were also found to pay 52% more on average than new customers. Virgin’s biggest increase occurred after the first 12 months on their VIVID 100 (108Mbps average speed) package, with the price rising 74% from £27 to £47 a month. In fairness, these offers do vary through the year and so it’s likely that a different ISP may occupy this position as discounts change. But Virgin are by no means alone. Much of the problem being highlighted above stems from the culture of discounting, which is a natural product of any aggressively competitive market, and how those are then promoted or perceived by consumers. In our view such discounts shouldn’t be a concern, so long as the ISPs make their post-contract prices completely clear; ideally right alongside the discounts (some ISPs do this but others don’t). 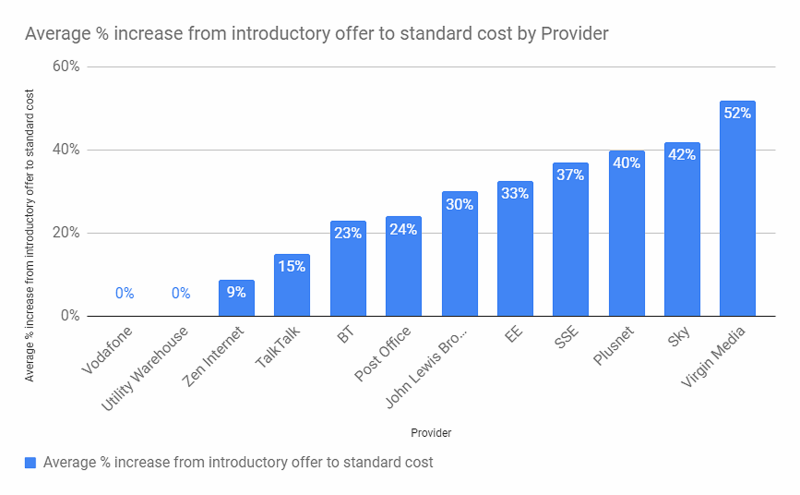 A few ISPs, such as TalkTalk, offer an alternative approach by enabling existing customers to re-contract on to a lower price point than their standard rate. Alternatively it’s also possible that a bit of haggling could save you a lot of money (see our ‘Retentions Tips‘ article ) but only about 10% of consumers do this. “It’s unacceptable that so many broadband customers get such a raw deal, paying over the odds for poor connections and being put off from switching by too-good-to-be-true offers that tie them in but don’t improve their speed. We note that many small ISPs don’t bother with discounts and instead adopt a standard price that doesn’t change, which is more honest but overall they can still be a little more expensive. On the other hand smaller ISPs may also deliver more advanced features (e.g. Static IP addresses) and better support or service quality, so it’s not all about price. 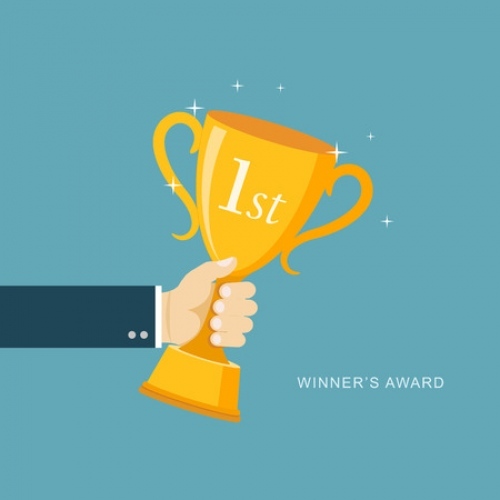 Overall Zen once again managed to top the table for customer satisfaction, followed by Utility Warehouse and Plusnet. By comparison three of the markets biggest ISPs could be found flopping around at the bottom. Sadly the survey’s sample size was far too small to cover the entire market and so we only get a partial reflection (i.e. take the outcome with a pinch of salt). 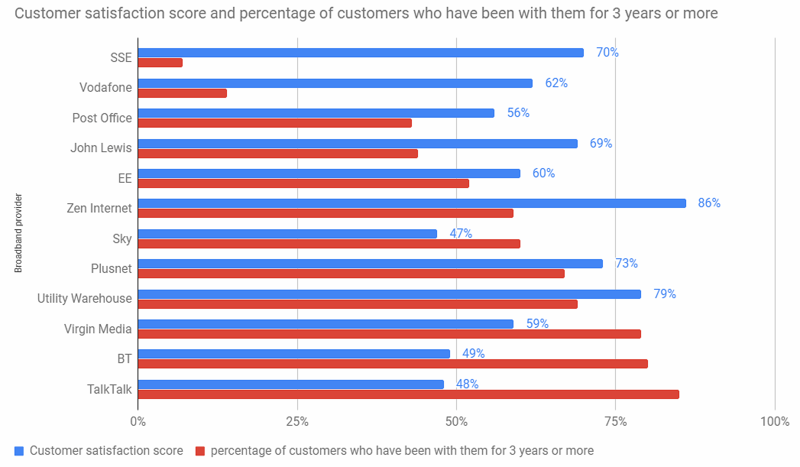 As you might expect many of the most highly rated providers also showed signs of strong customer loyalty, which is illustrated below. It’s worth pointing out that Ofcom recently proposed new rules, which will require broadband ISPs to inform customers when they approach the end of their minimum contract term (here). Sadly this won’t be introduced until later in 2019. On top of that the UK Government’s Competition and Markets Authority (CMA) has opened a “super-complaint” to examine how consumers who remain loyal to their provider can end up paying “significantly more” than new customers (here), but we don’t yet know what the outcome of that will be. Mind you some may note that Which?’s own consumer magazine appears to have a very similar model to what is being criticised above. After a 1 month trial at £1 the monthly price of the magazine increases to £10.75 automatically, unless Which? is notified (that’s a 975% increase – totalling an extra £117 a year). Of course broadband providers do often have longer contract terms but people in glass houses..
Added a comment from Virgin Media. “With our latest V6 TV box, faster speeds and new programming we continue to invest to give our loyal customers more – all while usage on our network grows. We make the price and length of a contract clear to customers when they sign up and the end date of any discount is contained within a customer’s monthly bill. We were with Virgin, after our original ISP was taken over. Their prices have always crept up, and getting rid of them was like trying to shake a terrier from your leg. That could be why so many people stay with them. Our neighbour has taken them on, and their cable has been ‘nailed’ to polystyrene cladding! That didn’t last long. Cityfibre commenting again about advertising has nothing to do with discounted offers. Just get on with rolling out FTTP and see what happens. Cityfibre are no more benevolent than OR. Discounting enticement to get people on contracts so they do not switch too often is not isolated to broadband. It is in many UK markets and the price difference has become far too large. While UK companies persist in this behaviour then we unfortunately have to play their game, make sure we are not dependent on any one of them and switch to the next best deal at the right time. Loyal customers pay for these offers and it is wrong. Currently most of the ISPs are using FTTC and therefore there is little difference in the service as your speed and service issues are dominated by the technology. However with FTTP it will be primarily be speed/price. As long as we have a FTTP choice then we will be able to switch but my concern is that for most of us we may not ever get a choice of FTTP. In some areas multiple different builders/providers may give you a choice of physical circuit and that gives price/speed choices. In many areas it will just be resellers of ORs Fttp packages. @Joe. OR may choose (or be discouraged by Ofcom behaviour) not to roll out in some areas. In addition new build neighbourhoods are appearing without OR presence. OR will no doubt retain a SMP within the UK however and therefore Ofcom will continue to regulate regulate but there will be a sizeable communities by 2025 that may be dependant on a single FTTP provider. If the service or the base wholesale price is high then this will be reflected in any ISP price. In some cases the ISP as well as the network will be fixed. FTTP will of course be significantly more reliable than FTTC however if the network provider’s service reliability or their cost is not to the consumers liking they will have less choice not more despite what Greg Mesch says. Their only alternative will be 4G/5G. I predict that FTTP prices will rise over time in real terms just like ADSL pricing has. Even the base products at £25-£30/m are already too high for those on limited incomes. Just look at Hull to see the effect of a single supplier monopoly. Yes KCOM are rolling out FTTP to all and are well ahead of the game, but the consumer has zero choice. And the most common complaint about KCOM is pricing. There will be more FTTP islands in the UK where providers will put the prices up once they have got you hooked. As I’ve said before, we are in the cowboy stage of an FTTP roll out. Just like the cable roll out of the 80’s and 90’s. The consumer is the one who will lose out long term. @Joe. I was referring to the base access cost not the increased performance. If social access only requires 10Mbps (browsing/single stream). UK broadband and Mobile costs are rising based on the RPI whilst benefits and many pensions are fixed to CPI. The last BT rise was between the two but the cost is increasing in real terms for those on benefits. Whilst ADSL remains cheaper on “offer” BT standard pricing now has ADSL above FTTC. So the issue for me is the minimum cost of access not increases in speed. I don’t know where these get there figures from . None of them are that good so its basically a farce . @Simon – Which? does a survey of members – which is one reason they get different results – so you cannot make the “cash for votes” argument here. I don’t care too much what these surveys suggest, as, for my cash, Plus.Net offers good value and staff are much more friendly than those I have encountered at Zen (on behalf of misguided clients who felt that paying more was getting them better service – it still comes down to a common denominator, Openreach, for the last mile or 6). Yes, I have a bias – I have been with Plus.Net for 15 years, but while I admit they are not perfect, I have my doubts that any ISP with a million or more customers can please all of them, all the time ! The Utility Warehouse number is especially suspect due to the business model. People who are daft enough to buy Which magazine, are obviously not in the money saving segment of the market. To be honest I’ve been a sky broadband customer for around 10 years, I was with a small bespoke ISP before them (can’t remember the name but they were the top for service at the time). I moved to sky purely to save money and was very apprehensive at the time but to be honest I’ve had very little trouble other than when I moved up to 80Meg fibre (the speed was terrible). I went back to 40 Meg and it was fine, I pay less now than I did 10 years ago, £27 a month for phone line and 80Meg FTTC.